KellyMitchell Makes Inc 5000 list! 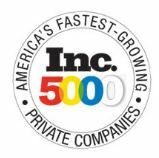 For the 7th year in a row, KellyMitchell Group has made the Inc. 5000 list of fastest growing private companies! The list represents the most comprehensive look at the most important segment of the economy-America’s independent entrepreneurs. Companies such as Microsoft, Zappos, Intuit, Jamba Juice, Zipcar, Clif Bar, Vizio, Oracle, and many other well-known names gained early exposure as members of the Inc. 500|5000. As we celebrate this accomplishment, we look forward to even more future growth and success!